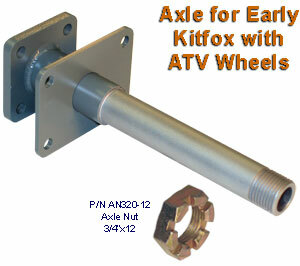 These special 3/4" diameter axles are designed to fit the early Kitfox with ATV wheels. Material: Heat treated 4130 steel with epoxy primer finish. Static Load Rating 600 lbs. For use with Kitfox ATV wheels. Save time and money with these custom assembled axle bolt kits. Each kit comes complete with all the correctly sized AN bolts, washers, nuts, etc. to properly install the axles to the landing gear.